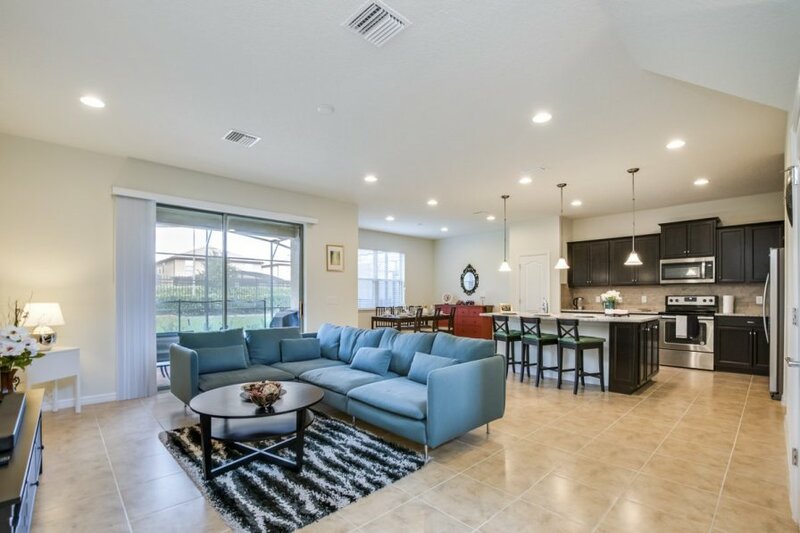 Villa Cindy is designed with families in mind, offering spacious, open-plan living areas, modern and comfortable furnishings, and located in an ideal position for visiting the Orlando parks. Situated in the famous Windsor at Westside resort, guests benefit from access to all the excellent facilities on offer, like a clubhouse, swimming pool and the fitness area. The area allows guests can enjoy the sunshine, laze by the pool, take day trips to the stunning Gulf Coast, or to explore the popular adventure parks as a family. If you are looking for ease and relaxation, with everything you need on your doorstep, then this is the perfect place! Spread over two floors, Villa Cindy offers five large bedrooms, with plenty of room to accommodate ten guests. The layout and furnishings are simple and straight-forward, ideal for those looking for a stress-free holiday. On the ground floor, everyone can enjoy quality time in the bright, open-plan entertaining room. Boasting a dining table, large corner sofa and a modern, friendly kitchen, this space has been designed for sociable. Everyone can be in the same room, even while busy with different activities, and with patio doors opening to the terrace, it is also easy to keep an eye on children playing by the pool. The bedrooms are arranged over both floors, with one double bedroom on the ground floor. Upstairs, there are three double bedrooms and a twin room. Through the villa, you will also find five modern bathrooms. Each room is designed to offer you ease and comfort, with plenty of room for all your belongings, there is no need to pack light! Outside on the patio, there is room to dine out, read your book, or cool off in the private pool after busy days exploring the parks. Villa Cindy is an excellent base for exploring this ever-popular area! Villa Cindy is a spacious 5-bedroom holiday house that can comfortably accommodate a family or group of up to 10 people.